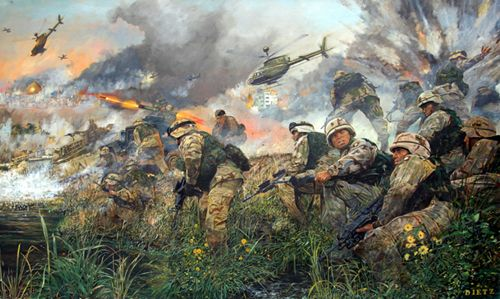 James Dietz Handsigned and Numbered Limited Edition Print:"The Battle for An Najaf"
Size: 15" x 25"/ Overall Size: 21.5" x 31"
About the Art: 1st Brigade Combat Team, "BASTOGNE" of the 101st Airborne Division captures the city of An Najaf. The fight to destroy conventional and Saddam Fedayeen forces in An Najaf, Iraq. April 2003. The actions in and around An Najaf, Iraq in the early days of the war would prove to be an historic step for US forces in the war against Saddam Hussein. The myth that referred to the inability of US Forces to succeed in the urban centers of Iraq would be crushed in the streets of An Najaf. More importantly, the fight for An Najaf set the standard and precedence for actions in all the major Iraqi cities, including Baghdad. Over the course of two weeks, the 1st BCT demonstrated the soundness of our Army Doctrine and the agility of the American Soldier. Fighting as a member of a joint and combined arms team the "Bastogne" soldiers utilized the full range of precision combat power from the rifleman and artillery to the employment of armor, army aviation and coalition air force assets. The BCT synchronized conventional, special operations, and Iraqi forces to gain a foothold, clear the city, and initiate civil military operations. The result was the destruction of enemy forces in An Najaf, the protection of critical religious and infrastructure sites, and the initiation of humanitarian aid for the people of Iraq. The balance of these diverse missions set the tone for the 101st Division's remaining ten months in Iraqi and set the precedence for future Army operations. The 1st Brigade Combat Team (BCT) attacked to seize the city of An Najaf, Iraq from 29 March 2003 to 8 April 2003. By succeeding in this mission, the BCT destroyed hundreds of Saddam Fedayeen fighters, protected the supply lines of the 3d Infantry Division and V Corps, and liberated the 840,000 residents of An Najaf. Following a 40hr Ground Assault Convoy, 1st BCT attacked the southern and western sides of the city. On 29 March, members of Task Force 1-327 attacked the Agricultural College on the southern side of the city and TF 2-327 conducted mounted, armed reconnaissance west of the city. Here the Tactics, Techniques and Procedures for fighting in an urban environment were first put to the test. On 30 March, TF 1-327 continued the fight in the south to the military compound, TF 3-327 attacked to seize the airfield, and TF 2-327 fired 41 anti-tank missiles in the area around the "Golden Mosque of Ali" destroying multiple Fedayeen strongholds without damaging this key religious site. By the end of the third day of fighting, the success of the BCT was obvious. By 1 April, TF 2-327 had seized the southwestern portion of the city and TF 3-327 had cleared the eastern part of the city, the village of Al Kufa and the bridge over the Euphrates River. In an effort to break the enemy's morale, a plan was devised to fight M1 tanks from 2-70 Armor through the main streets of An Najaf. In the early morning hours, a platoon of tanks executed this "Thunder Run" under intense small arms and rocket propelled grenade fire. On 2 April, a second "Thunder Run" was conducted with HMMWVs. The withering enemy fire did little to the US vehicles as they demonstrated both the might of the US Army and the futility of the Iraqi resistance. 2 April again proved to be historic. On this fifth day of the fight in An Najaf, TF 2-327 had coordinated to meet with The Grand Ayatollah Sayyad Ali Al Husayni, hoping to prevail upon him to publicly encourage the people of An Najaf to cooperate with US forces and Coalition Troops. The Task Force's movement to the meeting was disrupted as B/2-327 turned toward the Golden Mosque. Here the Battalion Commander, LTC Christopher Hughes, moved with the company. Instantly idle chatter and curiosity turned to rage, shaking fists, and throwing rocks. The crowd perceived that the U.S Soldiers were trying to enter the mosque. The battalion commander recognized the potential for violence and acted decisively to defuse the situation. In a moment captured by the media from all over the world and transmitted repeatedly on news networks for weeks afterwards, LTC Hughes ordered his soldiers to take a knee, smile and to keep their weapons held in a non-aggressive posture. Speaking words of reconciliation and respect, LTC Hughes directed the disciplined movement of his unit to an area away from the "Golden Mosque". The crowd which until that moment showed every indication of forcing the soldiers to shoot in self-defense, instantly recognized the goodwill gesture. As fast as the murderous, rioting sentiment had erupted in the mob, it was replaced by cheers and an indescribable release of tension. Again, the discipline and judgment of the American soldier was displayed as combat operations continued in the city. The city of An Najaf was important both politically and strategically. Due to its location along the Euphrates River and the bridges across it, the city had to be liberated. In addition to this, the city's population consisted of primarily Shiites Muslims. It was calculated that by liberating An Najaf, the Shiites would rise up and assist the Coalition in the battle. The process by which the 1st Brigade Combat Team liberated An Najaf became the template for all coalition forces during the remainder of combat hostilities. The V Corps Commander, LTG Wallace, spoke of An Najaf as the first major city liberated and the scene of the first Saddam statue to be toppled. The Battle for An Najaf - 1st Brigade Combat Team, "BASTOGNE" of the 101st Airborne Division captures the city of An Najaf, is dedicated to the members of the 1st Brigade Combat Team, "BASTOGNE", who made the ultimate sacrifice during Operation Iraqi Freedom. The many heroes of this incredible unit have nobly and willingly carried the accolades of their fallen comrades forward to the next "Rendezvous with Destiny".